to get a class which gives you access to all file operations and allows to arrange the items in a tree at the same time. This means you can’t directly attach it to a tree viewer. In some languages, like Python, this is trivial since you can add methods to a class any time you want. Other languages like C++ have multiple inheritance which allows to do something like this. Alas, not at runtime. where “desiredType” is usually an interface of some kind (note: The Eclipse API itself is still Java 1.4, this is the generics version to avoid the otherwise necessary cast). In the most simple case, you can just make the class implement the interface and “return this” in the adapter. Not very impressive. A factory which creates a tree adapter for the object in question. The tree adapter is the actual tree data structure. The objects still have no idea they are in a tree. So adding/removing objects will happen in the tree adapter. Things get complicated quickly if you have some of the information you need for the tree in the objects themselves. Think files: You can use listFiles() to get the children. This is nice until you want to notify either side that a file has been created or deleted (and it gets horrible when you must spy on the actual filesystem for changes). The factory must interact with the tree adapter in such a way that it can return existing nodes if you ask twice for an adapter for object X. This usually means that you need to have a map to lookup existing nodes. Note: I suggest to cache the adapter if you don’t plan to change it at runtime. This allows you to switch it once at startup and equals() will still be fast. And you should not try to change this adapter when the object is stored as a key in a hashmap … you will have really strange problems like set.put(obj); ... set.contains(obj) -> false etc. Or you can define an adapter which looks up a nice icon depending on the class or file type. The best part is that you don’t have API cross-pollution. If you have a file, then getParent() will return the parent directory while if you look at the object from the tree API, it will be a tree node. Neither API can “see” the other, so you will never have to rename methods because of name collisions. ITreeNode node = file.getAdapter(ITreeNode.class) also clearly expresses how you look at the object from now on: as a tree. This makes it much more simple to write reliable, reusable code. For a scene in one of my books (a public bath on the TAURUS), I need a ball of water suspended around the center of a large sphere. The sphere outside is the “ground” (you can walk around in it; it’s like the Hollow Earth theory but my version is just the product of careful alien design using magic a.k.a hi-tech to control gravity). I decided to render this in Blender to get a feeling how such a thing might look. What would my character actually see when they step into the bath? Boolean operators are traditionally a weak spot of Blender (they are a major strength of POV-Ray, if you like text-file driven modeling). I had some trouble to get it to work and if you want to achieve a similar effect, here is how I pulled it off. 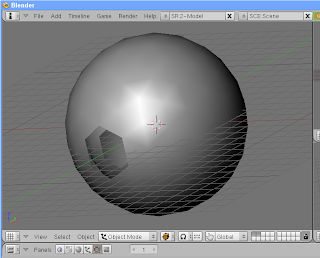 Since this is supposed to be the inner volume of the object, there is a problem: Blender thinks it defines the outside. The key information are the “face normals”. Open the mesh tools (Press “F9”) and select “Draw Normals” on the far right (in the “Mesh Tools1” tab; use the middle mouse button to drag the tab into view if you have to – it’s on the far right). Now the sphere sprouts little cyan pimples. Zoom in and rotate the sphere and you’ll see that they start on the center of each face and extend outwards. This is how Blender knows “outside” from “inside”: The direction in which the face normals point is “outside”. To turn this into the inner volume, all you have to do is to click on “Flip Normals” (“Mesh Tools” Tab, third line, last button). If you have “Solid” rendering active, the face normals will become tiny dots because the triangle faces now hide the rest of them. The object will still look the same but now, you’re “inside” of it. 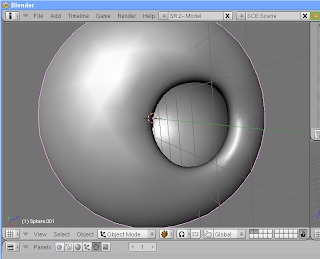 Since all objects in Blender are hollow, it doesn’t mean much … for now. I want a ball of water and water doesn’t have edges, so I also smooth the surface (“Set Smooth” at the bottom in the “Link and Materials” tab). 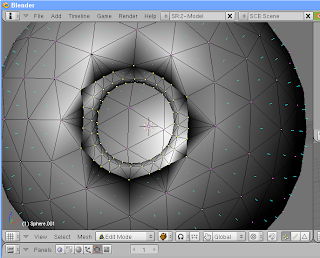 This doesn’t change the actual geometry; it just draws the object smoothly. In my version of Blender, the object suddenly went all black at this point. Probably because I haven’t assigned a material, yet. Selecting “Solid” rendering helps. Before I can create the outside, I must make sure that nothing is selected (or Blender would add the new points to the active object): Enter “Object Mode” (“Tab”) and select nothing (Press “A” until nothing is highlighted anymore). For the outside, I create another sphere. Make sure the cursor hasn’t moved, so the centers of both objects are the same. If it isn’t, select the sphere, press “Shift+S” (Snap) and then “Cursor -> Selection”. 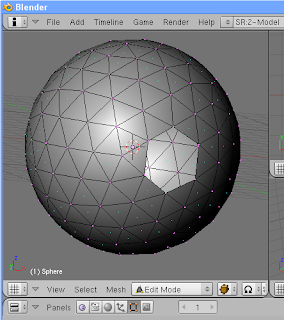 When everything is ready, add the second icosphere: “Space” -> Add -> Mesh -> Icosphere, 3 subdivisions, Size “5.00”. I also make that smooth but I leave the face normals alone (this is the outside after all). 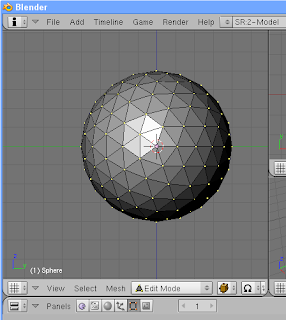 Again, I delete the face where the connecting hole is supposed to be: Select a point (in “Edit Mode”) and press “X” -> “Vertices”. Now, you might face two problems: a) the hole in the inner sphere is somewhere else and b) the hole might be below the one you just cut but it’s not perfectly aligned. If that is the case, you were in the wrong view. As you can see, I did erase the vertice on the Y axis. Next, shift select both objects (use the outliner if you have problems with the inner sphere) and join the objects (use the menu or “Ctrl+J”). Holy ugly! What’s wrong? I’ve left a hint … can you find it? Each piece of the red-white checker pattern on the walking spires is 10x10m, the ball hovers 1250m above the observer, has a diameter of 500m and the water is 50m thick/deep. The two blue cubes are both 100m big, one is standing on the opposite side on the “ground”, the other floats on the water. 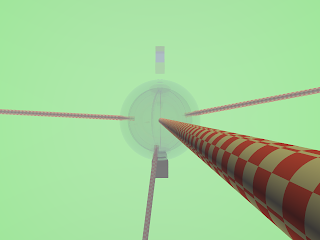 Anyone wants to add the water-slides, diving platforms (1250m jump! ), etc.? With that much water and these dimensions, we’ll probably also have clouds, too. The spires don’t hold the water there, by the way, they are just a means of transport (if you don’t want to jump or use the slides). You are currently browsing the Dark Views blog archives for November, 2007.